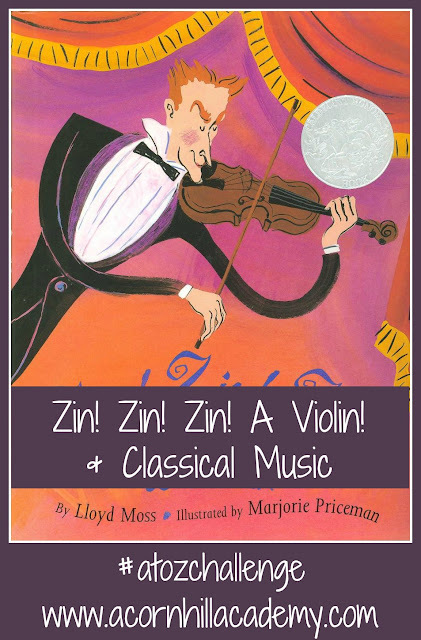 For the letter "Z," my final post of the #atozchallenge, I thought I'd share some of our favorite books for learning about classical music. One of the things I've enjoyed most in our homeschool has been exposing my children to great music, and we've enjoyed several books along the way. What's that, you say? How on earth does one teach about classical music with books? I'm so glad you asked! First of all, I want you to know that I know classical music is not all classical. I know about the musical eras. I promise. For the sake of simplicity, and for lack of a better term, I'm going to use the term "classical music." When my girls were young, I loved to taking them through Story of the Orchestra. It was a lovely introduction, first to the eras of music (Baroque, Classical, etc.) and then the instrument families of the orchestra, and finally, the conductor. There is a CD that comes with the book with musical selections to listen to as you read through the story. The first one is Wagner's "Ride of the Valkyries" - what a wonderful beginning! There are some other books along this vein, too, as that one seems to be out of print, which is sad. Meet The Orchestra, by Ann Hayes. You learn all about the instruments and how they work. There's no CD, but it's still a fun book. Another really excellent one is Carnival of the Animals. Jack Prelutzky, one of our favorite poets, has written verse to accompany the songs written by Camille Saint-Saëns. On the accompanying CD, he reads his poem preceding each corresponding piece of music. The last track on the CD is an uninterrupted performance of the entire thing. Zin! Zin! Zin! A Violin! is a wonderful picture book. It begins with a trombone playing by itself, but one by one, other instruments join in, until an entire orchestra is assembled. The best part about this book, for myself, having read it approximately a gazillion times, is that it rhymes. I don't know about you, but I find it more enjoyable to read books repeatedly if they rhyme. It makes them go faster, for some reason. I love the way the instruments are described: the violins soar, the reeds implore, the basses roar, etc. This is a great book for very young children. As my children have gotten older, we've enjoyed reading biographies of the composers we study. Opal Wheeler wrote several lovely biographies which are appropriate for children. Our favorites were the ones on Tchaikovsky. There is The Story of Peter Tchaikovsky, about his life in general, and then Peter Tchaikovsky and The Nutcracker. My ballerina loves Tchaikovsky, and we thoroughly enjoyed reading more about him. It's definitely worth looking to see if Ms. Wheeler wrote a biography of the composer you'd like to study. My 8 year old enjoys her books, and so do my high schoolers. I love that they work for a wide range of ages. Classical Music for Dummies is an outstanding resource. This book describes just about every facet of classical music you'd ever want to know. It discusses instruments, composers, the history of musical eras, musical forms, and includes a CD with examples of the works it describes. The one thing I didn't care for was it's often flippant, somewhat disrespectful tone. I'm all about fun, but there was a fair bit of innuendo I found unnecessary. Young Scholar's Guide to the Great Composers is a curriculum from Bright Ideas Press. We didn't use it for the curriculum; we use it as a resource for short biographies if we don't have room in our schedule to read a longer book. There are nice resources in this book, including discussion of the 6 musical eras, timeline, maps, a card game, and listening suggestions. As I said, we mainly use it for the biographies, but there's a lot there if you'd like to use it. It seems to be out of print in a printed version; I've linked to used copies on Amazon, but you can get a digital edition from BIP. There are many, many more books you can read with your children as you study classical music. I am a bit of a music nerd, so I love all the information, and for the most part, my children enjoy learning it, too. As this is my 11th year homeschooling, I'm able to see when their eyes start to glaze over, so I know when I've gone overboard. It's important to know, though, that Charlotte Mason's goal was to expose children to the great composers. It was not necessary for them to know their lives in great detail. If you don't have room in your read-aloud time for a composer biography, your have not ruined your children's entire education. Okay? I'm offering these resources as helps, not guilt-inducing devices. I hope to discuss classical music further on my blog at some point. Do you have any favorite books I haven't listed? I'd love to hear about them! I'm surprised at the sheer amount of books there are about classical music for kids, I wouldn't really think it would be something kids would enjoy but obviously I was wrong on that! You know, mine have really enjoyed it! Starting with things like Peter and the Wolf, and reading a bit about the lives of the composers, has made a big difference. You know what else is awesome for classical music appreciation? Bugs Bunny cartoons! Zin is not there in my old oxford dictionary. Congratulations for Successful A to Z 2016 Blog Writing.